Bean - The Ultimate Disaster Movie: When the Royal National Gallery of London is asked to send their finest scholar to oversee the unveiling of Whistler's Mother in California, they send their most inept and detested employee, in a desperate attempt to get him out of their lives. That employee is Mr Bean - the master of disaster! Within days of his arrival, Mr. Bean destroys everything he comes into contact with, be it the career and ma..
Bean is back in all new digitally re-mastered episodes! Re-live all of your favourite episodes across four hilarious DVDs in this side-splitting box set which has been digitally re-mastered for the first time. Watch from a safe distance as Mr. Bean's haphazard misadventures are brought to life in vivid, jaw-dropping clarity. This very brilliant box set contains all 14 of the original episodes, 2 sketches that were never seen on Televisi..
Mr Bean is feeling very left out when he discovers that Mrs Wicket is having a huge party downstairs and, apparently, he isn't invited. Also watch as Mr Bean is chased by burglars, gets a magician's trunk with magical results, creates a successful pizza business and takes dance lessons to impress his girlfriend Irma - but does he win her over? Special Features Nine Superb Adventures: Birthday Party, In The Garden, A Magic Day Out, Ball.. Celebrating 25 years with all of Mr Bean's funniest faces in one special package. Royal Film Performance: Waiting nervously in the line-up before a performance, Mr Bean rehearses meticulously for his Big Moment, with royalty. Toothache: Mr Bean bites off more than he can chew when he attempts DIY dentistry. The Rollercoaster: Mr Bean's Stomach does its own loop-the-loop on the rollercoaster at a fun fair. Eating Challenge: There's s..
More animated action from the hapless Mr Bean in eight hilarious episodes 1. Camping Bean wants to go camping, but his tent has fallen apart. He sets up rivalry with security guard. Holiday ruined. But revenge is sweet. 2. Chocks Away Bean builds a model aeroplane to compete with a boy’s in the park. 3. Royal Bean Bean breaks his favourite mug, the one with the Queen’s face on it. A chase through London streets brings him to Bucki..
More animated action from the hapless Mr Bean in seven smashing stories 1. Neighbourly Bean Bean wants to watch a programme quietly on telly but the neighbours won’t keep the noise down. 2. Nurse Mrs Wicket is ill - this inspires Bean to fake an injury, hoping it will get him a luxurious stay in hospital. 3. Dead Cat Bean thinks he's had Scrapper “removed” by accident by the dustbin men. He tries to find a replacement before Mrs Wi..
Own Mr Bean - The Animated Adventures - Racing Adventures DVD from Deff, DVD, Blu-Ray & 4K Video Specialists - Free UK Delivery..
First volume of the animated series based on the popular British television comedy about the eccentric loner and his slapstick adventures, voiced by Rowan Atkinson. In this volume, Mr Bean causes chaos while searching for a parking space, meets a mime artist in the park, and decides to clean his house, with disastrous results. Episodes are: 'In the Wild'; 'Missing Teddy'; 'No Parking'; 'Bean's Bounty'; 'The Fly'; 'Artful Bean'; 'Mime Ga..
Own Mr Bean - The Ultimate Disaster Movie DVD from Deff, DVD, Blu-Ray & 4K Video Specialists - Free UK Delivery.. The Whole Bean Collector's Boxset icludes 12 disc set: Live Action, Animated Series & Movies: Live Action Series Vols. 1-4 Animated Series Vols. 1-6 Bean: The Ultimate Disaster Movie Mr Bean's Holiday..
Mr. Bean is heading to the South of France for a simple holiday in the sun. His voyage from London to the Riviera soon transcends into one of mischief and mayhem! Mr. Bean inadvertently creates havoc wherever he goes culminating in an unscheduled and riotous screening of his own video diary at the Cannes Film Festival. Special Features Deleted Scenes: Over 22 Minutes Of Hilarious Footage That You Didn't See At The Cinemas!, 3 Featurett.. Number 1 Join family favourite Mr Bean in eight hilarious animated adventures. 1. In The Wild Whilst out snapping nature with his camera, Mr Bean gets angry when nature snaps back. 2. Missing Teddy Mr Bean discovers that in the world of organised crime, a teddy isn't always a teddy. Sometimes it's a rabbit. 3. No Parking Mr Bean can't find a parking space. So he makes one of his own. 4. Bean's Bounty Whilst digging for buried tr..
Mr Bean The Ultimate Disaster Movie: When the Royal National Gallery of London is asked to send their finest scholar to oversee the unveiling of Whistler's Mother in California, they send their most inept and detested employee, in a desperate attempt to get him out of their lives. That employee is Mr. Bean - the master of disaster! Forget volcanoes and alien invasions - horror now has a human face. Mr Bean's Holiday: Mr Bean is heading..
A triple bill of Mr Bean comedies. In 'Bean - The Ultimate Disaster Movie' (1997), Mr Bean (Rowan Atkinson) has obtained a job as an attendant at the National Gallery in London. He enjoys the protection of the chairman, but the gallery's governors are keen to be rid of him. When the Grierson Gallery in Los Angeles asks for an expert to give a speech on the recently-purchased painting of Whistler's mother, Bean is quickly despatched. On .. Celebrate 25 years of Mr Bean with this amazing anniversary boxset - including over 21 hours of Mr Bean mayhem and collectable Bendy Bean! Set includes all epsiodes from the original TV series, volumes 1 - 8 of the animated spin-off as well as two Mr Bean movies. In 'Bean - The Ultimate Disaster Movie' (1997), Mr Bean (Atkinson) obtains a job as an attendant at the London National Gallery. He enjoys the protection of the chairman, but t.. The Restaurant from The Return of Mr. Bean Mr Bean takes himself to a smart restaurant for his birthday but not all goes to plan when he orders the wrong meal. Birthday Bear Mr Bean forgets his teddy's Birthday - then gives him a treat to remember. The Disco from Mr. Bean Goes To Town Mr Bean goes for a night out at the Disco where he demonstrates his considerable dancing skills. Dinner for Two When invited to dinner by Mr Bean, it's.. Welcome to all of Mr Bean's funniest holiday moments in one compilation. Passport? Check. Ticket? Check. Teddy...? On The Beach - Mr Bean tries to change into his swimming truncks without taking off his trousers. The Swimming Pool - Mr Bean gets very excited about the prospect of a dive from the top board, is he really brave enough? Paking For Holiday - Mr bean packs for his holiday, but even that not straight forward. On The Tra..
Get ready for a bumper helping of bonkers Bean-tastic mayhem as Mr. Bean goes back to school! Whether he's totally clueless in his exams, trashing books in the library or blowing up the science lab, he's always in a class of his own! Back to School - The complete episode The Exam - Sketch The Library - Sketch..
Another nine episodes from the animated series based on the popular British television comedy about the eccentric loner and his slapstick adventures. In this collection, Mr Bean (voice of Rowan Atkinson) captures a troublesome mole, steals a cat and is terrorised by a fly!.. Own Mr Bean - The Animated Adventures - Egg & Bean DVD from Deff, DVD, Blu-Ray & 4K Video Specialists - Free UK Delivery..
Another nine episodes from the animated series based on the popular British television comedy about the eccentric loner and his slapstick adventures. In this collection, Mr Bean (voice of Rowan Atkinson) becomes the target of a fiendish prank on Halloween, makes friends with a seagull and finds an explosive surprise in his garden! The episodes are: 'Muscle Bean', 'A New Friend', 'The Lift', 'Dig This', 'Bean Hypnotised', 'Car Wash', 'Wh..
Join family favourite Mr Bean in eight hilarious animated adventures. 1. In The Wild Whilst out snapping nature with his camera, Mr Bean gets angry when nature snaps back. 2. Missing Teddy Mr Bean discovers that in the world of organised crime, a teddy isn't always a teddy. Sometimes it's a rabbit. 3. No Parking Mr Bean can't find a parking space. So he makes one of his own. 4. Bean's Bounty Whilst digging for buried treasure..
Join family favourite Mr Bean in eight hilarious animated adventures. 1. No Pets Bean adopts a dog, then a parrot then a chameleon but Mrs. Wicket won’t allow for any other pet than Scrapper in her house. 2. Ray of Sunshine Bean is desperate for a suntan and chases Sunbeam across town. 3. Birthday Bear It’s Teddy Birthday. Irma Gobb has remembered but Bean has not. 4. The Mole Mrs. Wicket’s croquet game is interrupted by an offen..
More animated action from the hapless Mr Bean in eight eventful escapades 1. Big TV Bean’s TV breaks when Irma has come for a visit. Poor as ever, Bean creates a Punch and Judy show to earn a bit of money to buy a new TV. 2. Inventor An inventor moves into the empty room in the Attic. Bean and the inventor try to out-invent each other. 3. Car Trouble The Mini won’t work anymore, so Bean is forced to sell it to the junkyard – hum. H..
1. A Running Battle Head to head competition with another runner, Goddawin – via the hospital and the department store. 2. Egg & Bean Bean adopts a strange orphaned bird – but is it a bird or a T-Rex? 3. Hopping Mad! Bean takes frogspawn from the pond in the park to his bed-sit. But frogspawns don’t stay little, do they…! 4. A Grand Invitation After saving a lady’s dog, Bean is invited to lunch in this grand old decrepit manor hou..
Own Mr Bean - The Animated Adventures - On Thin Ice And Other Wonders DVD from Deff, DVD, Blu-Ray & 4K Video Specialists - Free UK Delivery..
Own Mr Bean - The Animated Adventures - Superbean DVD from Deff, DVD, Blu-Ray & 4K Video Specialists - Free UK Delivery..
Own Mr Bean - Three Original Classic Episodes - Volume 3 DVD from Deff, DVD, Blu-Ray & 4K Video Specialists - Free UK Delivery.. Episode 1 - Mr. Bean Whether he is in The Exam, for which he doesn't know the answer to a single question, or On The Beach where he is trying to change into swimming trunks without taking off his trousers, or in The Church where he desperately needs to stay awake, Mr. Bean always finds an intriguing way of doing things. Episode 2 - The Return of Mr. Bean Mr. Bean has been given his first credit card and is determined to use it in Th.. 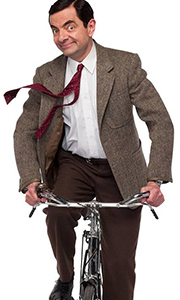 Episode 6 - Mr. Bean Rides Again Mr. Bean comes to the aid of a Heart Attack victim, with awful results. He fails miserably to Post A Letter, but after various mishaps, happily Flies Off on his holidays. Episode 7 - Merry Christmas Mr. Bean It is Christmas time and an excited Mr. Bean creates his usual havoc across the festive season. He brings new meaning to dressing the Turkey, whilst his girlfriend, Irma, looks forward to very sp..